Leadership in Forensic Science Laboratories. Origins and Rationale. Description: National Leadership Challenges. Risks, Problems, Barriers: Leadership Challenges in the Lab. Identifying Leadership Challenges: Insight from Forensic Leaders. Behavioral Costing of Human Resources. Lessons Learned and Recommendations: Measures of Efficiency and Effectiveness. 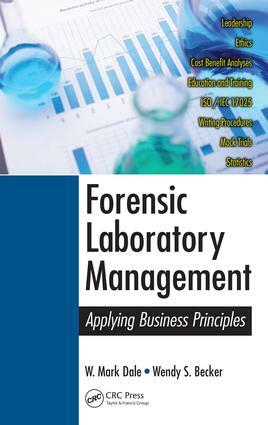 Forensic Laboratory Key Business Metrics and Cost�Benefit Analyses. Laboratory Management Performance Model. Law Enforcement Requirements. Costs. Capability. Cost: Efficiency and Effectiveness. Performance. Benchmarks for Best Practices. Basics of Cost�Benefit Analyses. Laboratory Excellence and Ethics: An Essential Association. Douglas Lucas. Why Is Ethical Conduct Important to Forensic Laboratory Management and Staff?. Ethics: What Are They?. Codes of Ethics: What Are They? Who Needs Them?. Examples of Some Ethical Problems. Why Do People Do Such Things?. Some Ethical Challenges and Dilemmas. Forensic Training, Education, and Institutes. Forensic Science Manager Job Requirements. Identifying the Need for Education, Training, and Professional Development. Laboratory Management Performance Model Professional Development Costs. Solution: Academic Institutes for Forensic Science. Advice for Students Considering a Forensic Career. Curricula. Dedicated Facilities. Two Student Cameos. The Capstone: Testimony. Major Academic and Institute Outcomes. Testimony. ISO Accreditation Implementation: A Framework to Implement a Quality Service. Harold Peel and Murray Malcolm. Background: International Organization for Standardization (ISO) and Accrediting Bodies. Why Consider Accreditation? Advantages and Some Considerations. Terminology. ISO/IEC 17025 (2005): Outline and Comment. Section 4. Preparation and Implementation. Writing Policies and Procedures. Lexicon. Scientific Procedure versus Administrative Procedure. Instructions on How to Develop Procedures. W. Mark Daleis co-principal of Becker?Dale Consulting and most recently the former program manager for Forensic Education and Training at the U.S. Army Criminal Investigation Laboratory (USACIL). Previously, Dale was the director of the Northeast Regional Forensics Institute (NERFI) at the University at Albany, State University of New York, providing education primarily in forensics biology. Before his position at NERFI, he was the director (inspector in charge) of the New York State Police Laboratory System, Washington State Laboratory System, and the New York City Police Department Laboratory. Dale has also been the president of the American Society of Crime Laboratory Directors (emeritus member), chairman of the New York State Crime Laboratory Advisory Committee, and member of the New York State Commission on Forensic Science. Dale is also an ASCLD/LAB Legacy and International ISO/IEC 17025 trained auditor, ASQ Green Belt Six Sigma certified, and has participated in many ASCLD/LAB Legacy inspections. Dale has coauthored several forensic science management publications with Dr. Wendy Becker.